All the while, the social movements have been tricked into standing by and waiting for Syriza to fulfil the role it assigned for itself: that of the mediator between social resistances and political power. The government is gaining political time, while movement demobilisation means that struggles are defeated one by one: The self-managed workers of ERT banished by the new management, the anti-mining movement in Halkidiki seeing the destruction of its land... Who is next? Maybe self-managed VIOME, struggling to legitimise its activity in adverse conditions? Maybe Thessaloniki's water movement, which fiercely fought and stopped privatisation, only to see it back on the table according to the terms of the new memorandum? The failure of Syriza’s splinter “Popular Unity” to mobilise left-wing voters comes as no surprise: despite the anti-memorandum rhetoric, the new party repeated some of the more objectionable practices of Syriza: It was constituted in a top-down process, solely on party cadres, built around flamboyant and self-centred personalities, projecting a hegemonism towards movements and other political forces, seeking followers rather than allies, projecting its state-centric program of national capitalist reconstruction outside the euro as the holy grail of transformatory politics. It failed to mobilise ex-Syriza voters, most of whom preferred to stay at home rather than go out to vote for Popular Unity; it also failed to convince the disenchanted movement-friendly party base of Syriza, which to this moment remains politically homeless. It thus allowed Tsipras to emerge as the absolute winner of the electoral game. 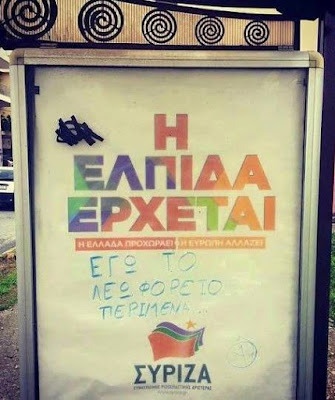 Firstly, it is a perfectly respectable stance to vote for Syriza as the lesser neoliberal evil. Voting by definition involves complex calculations, political blackmail and a host of ethical dilemmas that the Greeks have faced three times in less than 8 months. Those who abstain for political reasons cannot claim moral superiority over those who use their vote instrumentally in this fluid and complex political situation. But let's not assume either that all the people who cast an instrumental vote for Syriza in order to prevent the reinstatement of the hated New Democracy are going to stand by with their arms crossed when the government begins its raid against people and nature in the next few months. Secondly, and most importantly, while the political system is designed to maintain appearances and guarantee the continuity of power, no one can deny that the most significant aspect of Sunday's elections was the abstention skyrocketing to 45% from 36% in January and from 29% in 2009. It is easy to calculate that in a country of 10 million registered voters this translates to over 4 million people who do not vote, or about 1 and a half million people who have lost their faith in the political system since the start of the crisis. This last figure represents about as many people as those who vote for either of the two major political parties. We shouldn’t hasten to claim all these people for the forces of social emancipation and self-determination, as some anarchists would have it. Certainly a critical mass of people refrains from voting because it has a conception of politics as an embodied collective process, not as a ritual stuffing of the ballot box -even of one does not necessarily preclude the other. Nevertheless, a wide range of motives and circumstances can lead to this disenchantment, which can include apathy, helplessness, individualism and resignation. While the political system could not care less about this huge mass of disenchanted citizens –as long as they stay at home and they do not vote for protest parties that could cause disruption, it is all the same to them. Indeed, the ones that should be really concerned about this part of the population should be the social movements and the ideological movements that feel closer to the grassroots, namely the libertarian movement and the extra-parliamentary left. How can we break through the wall of apathy and individualism, connect with the desires and aspirations of the disenchanted population, cultivate collective spirit, social organisation and creativity, desire for change and emancipation? Unfortunately large chunks of the libertarian and leftist movements are more concerned about preserving their own identity than connecting with the disenchanted classes. We circulate our indecipherable manifests, largely for internal consumption; we cling to our ideological purity and our maximalist rhetoric; we shout out our angry slogans and cradle our flags; we boast when we have a handful of protesters more in our marches or when our parties get a few thousand votes more in the elections. All the while, millions of people out there are hungry for social change, but are probably resigned into an individualistic existence, and we have no means of getting through to them. While many would interpret the 45% of abstention as a healthy rejection of the pointless simulacrum that is representative democracy, it can as well be interpreted as a failure, or rather as a chain of failures: The failure of a social order to incorporate large chunks of the population in the mainstream of social life; the failure of a political system to offer effective avenues of changing said social order; the failure of the social movements and the left to create a new imaginary of transformation of this political system. The politics of “there is no alternative” promoted by our left-wing government are sure to heighten resignation and apathy; nevertheless a society under extreme pressure for so many years is definitely bound to explode sooner or later. The social movements in Greece have produced admirable responses towards self-emancipation in the last few years, but they have failed to articulate these responses into a coherent voice, a proposal for overcoming the present political and economic order. They have idealised partiality and fragmentation, they have not addressed the issue of political organisation, and have thus been tricked into submission by the hegemonic project of Syriza. The pyrrhic victory of the left in last Sunday’s elections should initiate a process of critical reflection, both in Greece and throughout Europe. We have ahead of us difficult moments of resistance, and the social movements, however small and insignificant, constitute at present the only remaining antagonistic force against capitalist barbarity.